Today is my studio day and I'm hoping that I actually get it. But that may not be the case. DH is still sick and he works for me on Wednesdays. I may well get a phone call in the afternoon to come into the shop and work the rest of the day. That would mess up my laundry, working on my final pic for Binky, and my weekly phone call with Marlyn. All things that I was looking forward to (well, to be truthful, I usually don't look forward to laundry, just to the results of having clean towels and clothes). But, if I have to, I'll go in and try to work on my laptop instead of at home. I won't be happy though. Even though DH is horribly sick with this cold/flu, he still managed to pull off an amazing Valentine's Day for me. When I arrived home there was a vase with a single red rose at my place on our eating table with three cards and a note propped up against the vase. Opening the refrigerator, he had purchased sushi and shrimp for our dinner and lemon cake for dessert later on that evening. It was really wonderful. I know I'll be up on the scale this morning - all that rice always makes me put on a pound or so. But that will be off in a couple of days and it was SO worth it. Today he was up early (really messing up my morning schedule, but I'm trying to work through it) and gathered the trash together for me. I'll still have to check and make sure he got it all, but if so, he saved me a little bit of time. Why he's up this early? I guess his cough just wouldn't let him sleep, but instead of trying to get back to sleep, he's been roaming around, coming in to talk, then leaving again, etc. *sigh* I hope he gets better soon. Thanks to the many of you who sent positive wishes to him, I'm sure they are helping. Current Location: Getting ready to wrap things up. That sounds like a very good Valentine gift - just lovely. I felt very fortunate, that he would do this even though he felt absolutely terrible. And he would have worked for me today, but I just couldn't put him through that. I would rather he spend the day in bed and try to recover his strength. P.s. Which fortress is on the first picture? I like it a lot. He really is a sweetie most of the time. But he's a dwarf and I'm more elven, so there are areas of miscommunication regularly. He calls me the love of his life though, and we will have been together for 35 years on the 20th of this month. A long time. 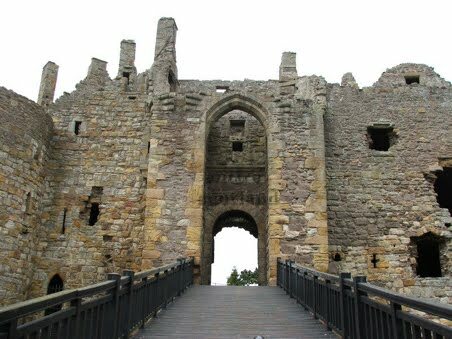 The fortress is Dirleton Castle in Scotland. I'm using it as the base of a pic for Binky's story, although since I have to work for DH today (he's much too sick to leave his bed) I will be running late and may have to use photoshop more than actually drawing the item. Bummer! Oh, I would love to get to Scotland. Right now, I'm hoping that I can retire within a few years and then travel to Florence. I really want to spend some serious time in Italy, then go to Spain and on to Paris. I'm not sure if DH will be up for travel though, although he does want to do the museums as much as I do. We love art museums. My DH isn't short (well, 5 ft, 6 inches) but he has a round face, bushy beard and his hair is longer than mine, so past his waist. He makes a great dwarf. My good friend is a Hobbit, and I'm totally a "pointy-eared Elf" - LOL. We'll just have to see what happens. I think we will meet one day - it is our destiny - LOL. I have learned, over my 57+ years though, that planning too far into the future sometimes just leads to problems. Our travel rests on a great deal of things falling into place, rather like a domino array falling just right. So I'll work it one day at a time :-) But...it will happen eventually, I'm sure of it. He can use all the good wishes he can get, he is one sick DH. I made him stay home from work today, even though I really needed the studio time. I'll just have to make do. It really was. Now if he was just feeling better, all would be good. A burger sounds good, actually. I had planned to just have soup, I knew he was feeling poorly. When I opened the fridge and saw all of the goodies, I was simply amazed. What a lovely Valentine's meal--yay sushi! Hope he feels better soon. He just phoned and still sounds horrid. He's spent most of the day sleeping, which can only be for the good. I feel so sorry for him, it's no fun to be this sick. Valentine's was just sweet. That he would take that time and effort even though he felt horrid was humbling and so loving. 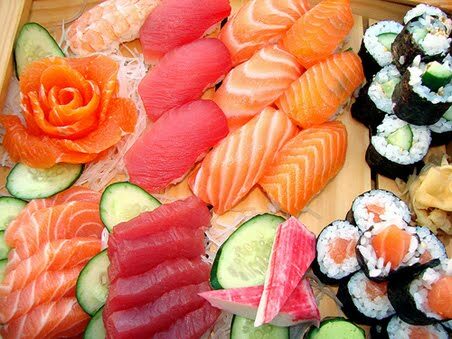 What a wonderful Valentine's gift - that sushi looks yummy! The sushi was amazing and wonderful. Sometimes he can amaze me. His illness has made getting your final pic done on time a bit harder, but I'll work on it tonight and should have an answer on "yes" I'll have your final pic done on X day or "no" things just haven't worked out by the end of the day on Thursday. I know we're running a time deadline and don't want to cause problems, but RL is getting in our way - LOL. Feh! I'm skirting the edges of catching this and I'm terrified that I will. I have two intense weeks of work coming up, then B2M# starts and I'll be swamped with writing for a month. I don't, don't, DON'T need to be sick! I agree, my Valentine's was very sweet!